A microchip that complies with ISO 11784 or 11785 standards (unless you want to carry around your own chip reader). This microchip must be implanted before vaccinations are given, because the ID number has to appear on all of your pet’s travel and health documents. A rabies vaccination, administered not less than 30 days or more than one year prior to departure. If it’s a booster shot, it can be given within 21 days of travel. A USDA veterinary health certificate (USDA APHIS Form 7001). It must be signed by your vet at least 21 days after your pet’s first rabies vaccination. If your relocation will take you to Sweden, Malta, or Ireland and your pet is a dog, he will also need to be treated for tapeworm prior to travel. If you and your cat or dog currently reside in England, Scotland, Wales and Northern Ireland, two things could happen. Either an agreement will be reached, which would specify how pet travel will be handled between the UK and EU, or there will be no deal, in which case there will be confusion. 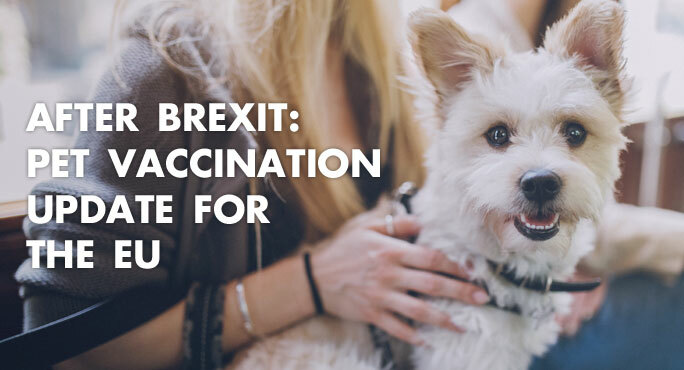 That’s why British news media have warned for months that citizens planning to relocate to or visit an EU country with their pets should start that process at least four months in advance. The EU Pet Travel Scheme was developed to provide smooth, simple border crossings for pets as well as people within the European Union. Once Britain is no longer a part of the EU – deal or no deal – British pets won’t qualify for that program. If your pet currently has an EU Pet Passport, it will no longer be valid. That said, if there is a formal exit deal and an implementation period is identified, you can still use your pet’s passport during that period. You can’t cross borders just anywhere, though. You will have to enter other countries via a designated Travellers’ point of entry (TPE). After Brexit, the UK will be treated just like any other foreign country. However, that could actually mean one of three possibilities, because countries around the world are categorized according to their rabies status (and sometimes according to existence of other easily-transmitted diseases or pests). How the EU will categorize the UK remains to be seen, so pet parents wanting to travel there will have to be prepared for almost anything. If Great Britain is listed as a favored third country (like the US), the rules noted above will apply. If the UK is unlisted, you will need more paperwork. The best way to stay on top of this evolving situation is to consult the British Government’s own website, which is regularly updated. What if you’re moving to the UK? Requirements will remain the same to enter Great Britain with your pet, no matter where you live now. The key to successful international pet travel is always staying up to date. Any country can change their pet import requirements, at any time, and you don’t want to be caught off-guard. While it’s pretty easy to find current rules for many countries, that’s not always the case. And, in any event, researching the information can be tedious and, sometimes, confusing. The one certain way to know you’re getting accurate advice is to contact our team here at Starwood Animal Transport. We live by these rules daily.